This spacious and attractive barn conversion is located in the village of Jacobstow in Cornwall, only a short stroll from the beach and beautiful coastline. Bring the whole family along to be a part of this holiday adventure; whether you plan on enjoying some quiet time or taking on an adventure and activity-filled holiday, there is something for everyone to appreciate. Set on the ground floor, this accommodation boasts a super king-size double and a king-size double bedroom, both of which are comfortable and promise a good night’s sleep, so you can wake up feeling refreshed and ready for the day ahead. Two single rooms are also available, so you and your guests have plenty of choice for relaxing from one night to the next. For more of this, the sitting room is a comfortable place to unwind and overlooks the garden, where you can wander outside through the French doors to soak in the afternoon sun. Nearby, the well-equipped kitchen holds everything you need to try your hand at some baking or to gather with your loved ones at the dining area. The bathroom and utility room complete the layout. Jacobstow is filled with charm, and has a church and a Holy Well. The nearest shop and pub are situated close by at Wainhouse Corner, with the child and dog-friendly Old Wainhouse Inn. In easy reach is Bude, offering fantastic beaches and rock pools, plus a selection of cafe's to enjoy a spot of lunch in. Situated close to the owner’s farm with a lovely enclosed garden, you have all the ingredients for a memorable stay at Shepherds Rest. All ground floor. Two bedrooms: 1 x king-size double, 1 x twin (zip/link, can be super king-size double on request). Bathroom with bath, shower over, basin and WC. Kitchen with dining area. Utility. Sitting room. Note: Dogs must be kept on a lead at all times when outside. The small village of Jacobstow in North Cornwall has a church and a Holy Well. The nearest shop and pub are situated close by at Wainhouse Corner, with the children and dog-friendly Old Wainhouse Inn offering good food and real ales. Within reach is Bude, a fabulous coastal town that once visited you will want to come back to time and time again. Bude has something for everyone, great beaches for relaxing, and building sandcastles on, rockpools for investigating at low tide and cafe's to watch it all from. The rolling waves are great for surfing all year round, and the footpaths by the restored canal or on the North Cornwall coastal path offer you a superb opportunity to explore and appreciate the outstanding countryside. Bude also has a superb golf course, indoor swimming pool, bowling alley/indoor play area and Heritage Centre at Bude Castle. It also has a good selection of local shops, supermarkets, cafe's, pubs, restaurants and excellent Information Centre, plus within walking distance are the remains of a huge iron age hill fort at Warbstow Bury, from where panoramic views can be seen. For days out, take the coast road north to see the lonely lighthouse above the sea at Hartland Point or walk or ride a donkey down the steep and cobbled village street (no cars allowed) of beautiful Clovelly to the harbour and the pub far below. 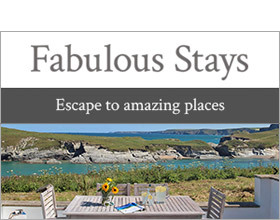 Follow the coast in the other direction and there's the little cove of Crackington Haven, Boscastle, King Arthur's castle at Tintagel, Doc Martin's Port Wenn at Port Isaac and yet more great surfing beaches at Polzeath.